No seriously, I've got a lot of Armada articles to write too! Wave 7 released a lot of really interesting officers, which all are very competitive for their slots. Unfortunate that every ship can only take one. (Yeah, yeah, Phoenix Home) Let's talk about the Imperial specific ones. Medium or Large ship only. 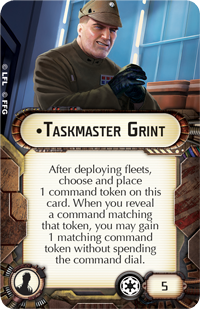 After deploying fleets, you may place 1 round token on this card. If you do, during the round matching that round token, you must activate at the end of the Ship Phase (after all other ships have activated). Remember how I said earlier that Raddus was one of three upgrade cards that break how the game is played. Pryce is the second of these, messing with the concept that "More activations give you last activation". Pryce goes on a heavy hitter, which you can then (with good planning) activate last, move into excellent position, and then unload hell on someone early in the next turn (with theoretically a first player activation). 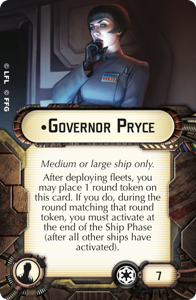 Note that Pryce can't go on the ship one might argue you want her most on, the Demolisher, as it is a Small Base ship, and she can go on Medium or Large ships only. So, you're most likely to see her on an Imperial Class Star Destroyer, most likely a I-Class or Kuat-Refit, to run it Speed 3 into a prime shooting location. Another thought for Pryce is putting her on a VSD II-Class with Disposable Capacitors, and predicting the turn when the target enemy ship will enter Long Range. Then you can unload without retaliation, then once more the next turn. Combine with Screed and Heavy Ion Emplacements, and you can strip a heavily armed flagship raw. When defending at distance 1-2 of an obstacle, during the Spend Defense Tokens step, you may exhaust this card to choose and cancel 1 attack die. 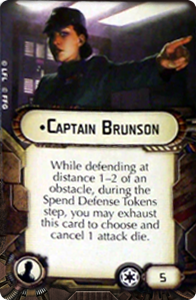 Well, the obvious idea is to put Captain Brunson down on an Interdictor - specifically one with the title - so that you can get two uses out of her. But still, 5 points to reduce damage by 1, and possibly by 2 or removing a critical effect from the table, is a decent defensive investment for your ship. Especially since she works at any range of attack. It also means that if you're using her, you're thinking of using the obstacles to provide you with cover on your approach instead of using them to block your opponents lines of approach. My thought is that she will be a great investment that will be overshadowed by offensive officers. Instructor Goran must have instructed Dengar at some point in his life. Good for keeping your fighter cover prickly, especially if you are using them as close defense for your ships. His best use is with TIE Fighters, giving them Counter 1 when they already have Swarm, and thus a .75 expected damage return every time they are attacked. TIE Interceptors who already have Counter 2 get diminishing returns for every extra dice added, as you can only reroll 1 die with Swarm, and non-Swarm squadrons only get a .5 average damage added on. One other exception. Darth Vader gives you a nice .75 due to being able to use Criticals as damage. Pair with Dengar and Sloane for MAXIMUM RIDICULOUSNESS. 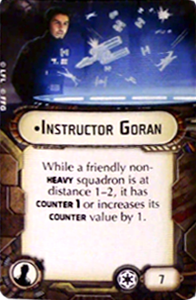 Note, he only adds his bonus to non-Heavy squadrons - so any Intel squadrons will lock him out of being useful. Also note: You might think General Draven is his arch-nemesis, giving his ship an extra die when attacking Counter squadrons. But not true! As we know from the Jamming Field Errata - "The attack MUST be treated as obstructed" we are reminded that upgrade cards are optional unless they specify a "MUST" in their text. As Instructor Goran does not, you can choose to "turn him off" when you are being attacked by a General Draven ship. You can also choose not to, if you'd rather take more damage, I guess. 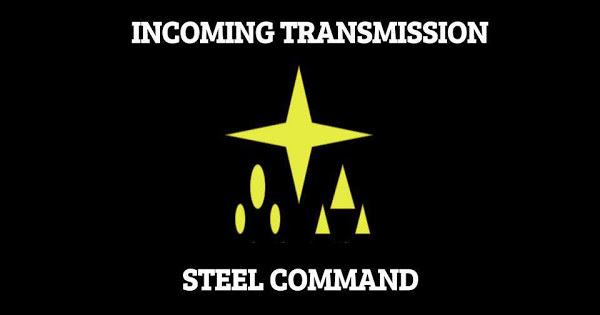 After deploying fleets, choose and place 1 command token on this card. When you reveal a command matching that token, you may gain 1 matching command token without spending the command dial. 5 points for a bonus token? Well, what could we do with something like that? The most obvious answer is an extra squadron activation, because extra squadrons are always good ideas, and the cost of extra squadron activations is already set solidly at 5 with Expanded Hangers. So slap him on your Quasar, and fire off 6 Defenders at something, and save 2 points over Wilhuff. But wait, there's more! He's great on Sovereign / Cymoon because let's face it, you're should remember your ABCs (Always Be Commanding - Navigate) so you'll have a token to switch to Intensify Firepower! your favorite Fleet Command! Hell, he's just good for giving your ISD a pretend Ozzel effect, because Speed 1 to Speed 3 ISDs are freakin' scary. He can even go on a Comms Net Gozanti and toss your favorite ship a Navigate token and still control his own speed. He's GREAT, but Officer slots these days almost need to be broken to be used. That's it for Imperial officers. The's a lot more to go over - Rebels and one really, really important unique generic.